This feminine silhouette features a flattering waist and flirty hem, all in smooth Japanese crepe. We obsessively tested the length too. Meaning, you’ll never show too much leg while sitting down. Made in NYC. A-line silhouette with a forgiving fit that falls above the knee. Our model is 5’9” and wearing a size 4. 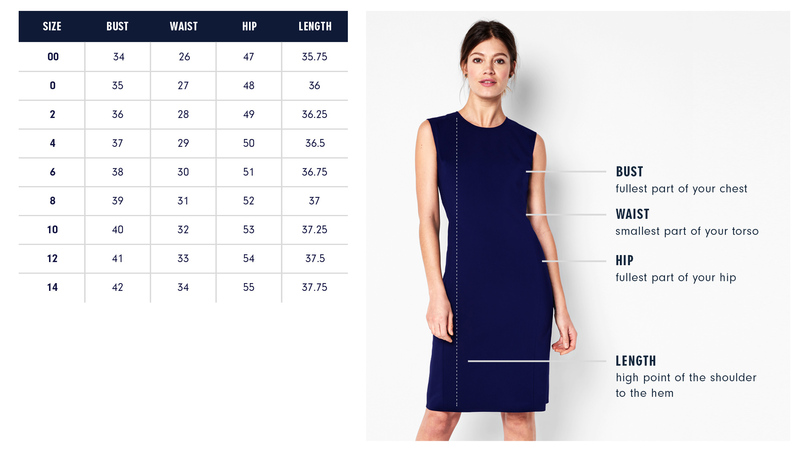 Below are the exact measurements of the Greenwich Dress. All measurements are in inches. For general brand fit, sizing, and measurements, please visit our Brand Fit & Size Guide. A-line silhouette with a forgiving fit that falls above the knee. Waist seam falls at natural waist. I love the subtlety of the topstitch detail on the Greenwich dress. Topstitching is generally used on heavy-duty fabrics so I like utilizing it on this fluid crepe - it’s unexpected.